I’ve long been a proponent of collaborative relationships. Libraries should be collaborating with their communities to see what sorts of projects can be developed that benefit the library, the partners, and the community. Doing so makes good sense – fiscally and socially. The smiles of St. Paul children are in jeopardy, so city officials and dental care advocates are expanding a program to rescue them. St. Paul Mayor Chris Coleman announced a new partnership Thursday to provide dental care to disadvantaged children in several neighborhoods. The Smiles Across Minnesota Coalition will bring dentists and dental hygienists closer to children who may not get adequate dental care. The coalition will expand the reach of an existing program that brought dental care to St. Paul schools and Head Start Centers, which help economically disadvantaged pre-school children prepare for school. The new partnership will bring these dental services to libraries, parks, and community centers in targeted St. Paul low-income neighborhoods. What a fabulous idea. I’m not sure who thought to include libraries in this – whether the city contacted the library or vice versa – but it’s a perfect example of a collaborative venture that will no doubt benefit not only those that take advantage of the service, but the dentists and libraries as well. The Tibetan monk in the Washington D.C. airport, dressed in the traditional red robe, with shaved head…..and Crocs. The woman dressed in a brilliant yellow African dress and headpiece at the Convention Center. The bus driver who pondered over the fact that all of the busloads of people he had driven all day were so quiet…until I reminded him that we are, after all, librarians. The various people I met throughout the conference who were interesting and interested, and with whom I ended up having fascinating conversations. And finally, the four soldiers on the plane home. I thanked them for their duty, and they responded graciously. When we landed, the flight attendant made the typical landing announcement (We have now landed in ….. the time is….) and then added that “we welcome our soldiers who have flown with us today, and thank them for their duty in defending our country, and remind them that they’re in our prayers as they serve in Iraq.” The plane burst into a long applause. The man is charming and self-effacing, and looks incredibly young for a man who has been making documentary films for over 30 years. He spoke eloquently of history and especially of the importance of the common man. The man crafts his sentences with obvious care, choosing words for precisely the meaning he wishes to convey and delivering them in a cadence that earns rapt attention from his audience. Burns has just completed a 6-year project entitled, “The War,” about World War II. In researching the project early on, he visited the New York Public Library and was taken on a tour by Vartan Gregorian. At one point, Gregorian stopped, indicated the miles of stacks around them and said, “This is the DNA of our civilization.” Burns loved the quote – as did we. PBS will begin broadcasting “The War” on September 23, 2007. The audience this morning was treated to a one-hour sneak preview of the mini-series, though Burns told the audience that he wasn’t terribly comfortable with excerpts, and so he had instructed the ushers to lock the doors. “If we go straight through without bathroom breaks, we should be be able to see the whole series by 11:30 tonight.” I have a feeling some of us would have been willing to stay. The piece was moving and, as usual with Burns’ work, beautifully done. The whole series will be worth watching. “There are no ordinary lives,” Burns said. Well and truly spoken. What a wonderful man. Community Involvement and Rural Libraries: How do we make it happen? Jana Ponce, Library Director, Parker Public Library, Parker, AZ. First library job was as a bookmobile driver, which she got because she knew how to back up a horse trailer. Has now been at the library for 20 years. – Market in those areas! – Who are your movers and shakers? Get to know them well! – Need buy-in to be successful, from community, supervisors, board, and staff. – Low cost – Paint mistakes! – Weed – weed – weed! – And Always: Offer the library to everyone you are talking to – remember we ARE in the business of SALES! We just don’t charge for our services! Question: What does it mean to have a library that’s the hub of the community? What is our useful social mission, and how do our core values reflect that? Can sometimes be uncomfortable being the hub of the community. What are we doing to form those relationships? As rural librarians, we’re never off the clock. We’re in the community, volunteering, and we know many of the members of the community. We know the areas of interest of our people and our collections reflect those areas. We’re the bulletin board for our community. Make sure policies reflect what we do in our libraries. Library as physical place – it’s easy to be the hub if you’re in the middle of town. How to address if you’re not? Work with the buses for free rides, signs on the sidewalks (like footprints) leading you to the library. Making the hub relevant – Spanish Language Outreach. Connecting with the churches for them to provide resources to Spanish-speakers, too. Volunteers and librarians are in the hub, with strong spokes going out into the community. Change the perspective of the people as they often don’t know what the library is about. When you see a public library that’s the hub, you can almost see it vibrating out, like a hub. Meeting rooms can be a great way to bring people into the library, especially in a rural community. Needs to be thoughtful approach to adding programs. Library is a behind-the-scenes hub. Library was rated in one state as the most important resource, even among non-library users. The library should be a comfortable place – ban the hard, sharp, and brown. The more the library makes itself useful to community organizations, the more they make themselves useful to the library. We need to work together as a whole with everyone. Hub=dispatch; an information referral source. We need to treat everyone with the same service attitude. Equal access and broadband – more and more applications are online. It’s a new role for the library, working with state and local government to coordinate services. After lunch, the room was transformed into a cafe. The afternoon exercise was directed by Stephanie Gerding and Joan Clark who introduced the Rural Cafe, based on the World Cafe. People have a conversation at one table, and then after ten minutes people shift to another table, to have a conversation with another group. Each table selects a host, who doesn’t move and is the conversational host for the table. People move once more to another table, and then move to their original table to see how the conversation has transformed. With the same question asked at different tables, usually very different conversations take place. Take the time to thoughtfully listen. Try to contribute, even if you’re shy. Try to connect the ideas and themes together. Play, doodle, have fun, and be creative. Maintain IT is a three year project funded by the Gates foundation, focusing on the 18 states that got the original Gates grants. The overall purpose is to help libraries continue public access computing, mainly through information sharing and a compilation of best practices through the country. One solution will not meet all kinds of libraries; size is a good indicator for commonality. Rural libraries have challenges most urban libraries don’t face, such as a lack of IT support. Overall purpose is to spotlight best practices. Sharing stories on website and working with WebJunction. Distilling best practices into “cookbooks.” Cookbooks will hopefully be a useful tool to train staff and volunteers, to do routine maintenance, and to help develop a technical plan. You can participate in the project by using the cookbook and providing feedback – tell them what’s missing, what’s useful, and what’s not at all useful. The cookbooks are available on their website. Go ahead and get your own copy! …the WebJunction Rural Sustainability Forum! People attended from 30-some states, filling the room with excitement. All of the attendees put their name on a dot, and placed it on the map of the country. 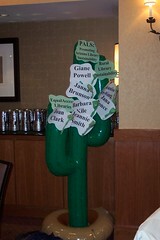 The delegation from Arizona brought their own blow-up saguaro cactus, making their table particularly easy to find. Jim Malzewski introduced the day, commiserating with the group on their various travel woes, welcoming an amazing number of librarians to their first ALA conference, and encouraging the collaboration of rural libraries. Jennifer Peterson went through the contents of the folder and announced the new Rural Sustainability ONLINE workshop. Brenda Hough served as M.C. for the day. I helped with the state introductions, moving from table to table having states introduce themselves to the rest of thr group. Since the introduction of 34 states can take a bit of time, we gave the spokespeople a two-minute time limit for their introduction. I was ably assisted by a delightful librarian from Wisconsin, who had a chicken and played the “Chicken Dance” along with him that clucked when time was up. Think being played off the stage at the Academy Awards. The introductions tended to run a bit longer than hoped, but all were fun and informative. I’m here, along with many, many librarians. Unfortunately, you can spot us fairly easily…perhaps we should draft the “What Not to Wear” people for help. Wednesday was a whirlwind trip, from Minneapolis to Washington. Once safely past security (memo to self: buy stock in ZipLoc) I grabbed a quick lunch that is probably only available in Minnesota: a lefsedilla. 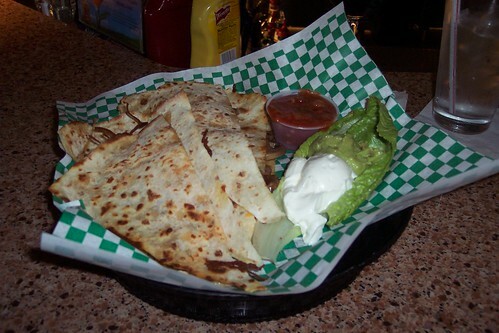 That’s a quesadilla, but instead of using a tortilla, they use lefse. Pretty good, actually. Yesterday was spent preparing the room for the WebJunction Rural Sustainability Forum. We decorated the room’s tables with state flags, which was a bit of a challenge as most of us only know one or two state flags by sight. Luckily, the flag manufacturers had placed a handy sticker identifying the state on the flag. There was one mystery flag that was stickerless and had no other identifying hints (like the name of the state, which many states thoughtfully print right on the flag.) Turns out, the flag’s was Georgia’s – and not a peach in sight. Today will be the all-day session, followed by a WebJunction reception, followed by the premiere of “The Hollywood Librarian”……if I last that long. Bed just might call before the movie, but we’ll see. I’ll be blogging during the day, so stay tuned! I’m heading to Washington on Wednesday for ALA. I’m a newbie to that particular conference, never having had the budget at my small, rural library to justify my attendance. I’m heading out there thanks in large part to the folks at WebJunction; I’m working with the Rural Library Sustainability Forum, and I’ll be helping at the day-long pre-conference event on Friday. I’ve also signed on to be one of the PLA bloggers, so tune in to the PLA blog, too. At any rate, stay tuned for tales from the road to ALA.